Have you ever wondered what love looks like? 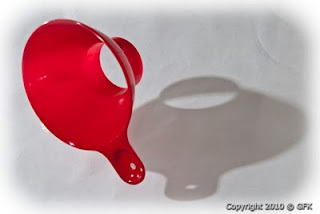 Yup, it looks like a red plastic canning funnel. Sometimes, love looks like dishes that are washed and dried (by the same person who cooked). Sometimes, love looks like a bag of chocolates or coffee beans (when there were no more in the house). Sometimes, love is invisible and can only be detected in its silence, support and understanding (when they are needed but not asked for). You see, love doesn’t always have to shine like gold and diamonds to be real (or valuable). When someone cares enough about you to give you a funnel (or coffee, or chocolate, or support), no amount of precious metal or sparkling gemstones will ever hold more meaning. Of your delicious word meal. Though I have no time for this pretty picnic. But I have been silent. Not for lack of awe or because I have no words. Under which I hope you get willingly wet.